Chef Alejandri’s career has followed a path set by sheer determination, with liberal infusions of luck. Ever since he spent his Saturday mornings watching Cocina de clase mundial (World Class Cuisine) on television as a child in Léon, Mexico, his goal has been to create his own Michelin star kitchen. He was entranced by the starched whites, the discipline and concentration, the air of respectful dedication in the kitchens of the then most famous chefs of Europe. He obtained a Bachelor’s degree in Hotel and Tourism Management from Universidad del Bajío Asociación Civil (UBAC) in Guanajuato state, then won a lottery for a paid internship at the newly opening Fiesta Americana hotel in Léon. Through sheer force of will he brought himself to the attention of the Executive Chef, but he declined the offered cooking position and chose instead to start in the dish pit, working his way through each station of the kitchen. Within a few years he was the executive sous-chef. Working in the restaurants of 3-diamond resort hotels in different regions of Mexico, Chef Alejandri deepened his experience with classic French cuisine and gained exposure to Japanese cuisine as well as a growing familiarity with an elevated version of the Mexican food of his childhood. Feeling that his culinary education needed a European perspective, he took an opportunity to move to Canada as a jumping-off point. When the changing international restaurant landscape made Europe a less appealing option and Toronto’s food scene showed signs of broadening and maturing, he decided to stay in Canada. He completed further training at the Stratford Chef School, staying on by invitation at Rundles in Stratford for two years under Chef Neil Baxter after graduating, and continuing to teach in the school to this day. His Toronto cooking experience has also included The Jamie Kennedy Wine Bar and Scara- mouche, Chiado, Sassafraz and Biff’s Bistro, among others. 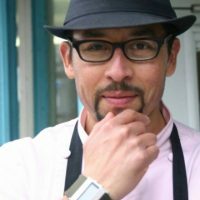 In 2011 Chef Alejandri opened his first solo venture — a cantina in Kensington Market, selling upscale versions of Mexican street food — and patrons quickly began lining up to taste what Anthony Bourdain called “some of the most amazing Mexican takeout north of the border — any border!” on the Toronto episode of Travel Channel’s The Layover. Local accolades also came quickly, resulting in a hasty business partnership and expansion to a more traditional location for Agave y Aguacate in Baldwin Village in 2014. The new venture continued receiving praise from patrons who came from across North America, allowing for a healthy profit within its first year of operation. After the amicable dissolution of this partnership at the end of 2015, Chef Alejandri took the time to survey his experience, gather his resources, and focus his vision. Alejandri is the realization of that focus: a restaurant dedicated to bringing the subtlety and finesse of authentic Mexican cuisine to Toronto; a kitchen where creativity and learning can thrive in an atmosphere of respect, discipline and passion.